Consider the following scenario: You need to perform email searches in your CRM and your search needs to look at the content (body) of your email messages. When you start having a lot of emails in your CRM (500k+ in my case), searches become extremely slow and you need to start to look at indexes or other solutions to make the search faster and keep your users happy. This post describes a solution that leverage a new CRM feature in CRM 2015 Update 0.1 (On Premise) : Full-text search. This is the easy part. If you are having this issue, you have probably done this already. 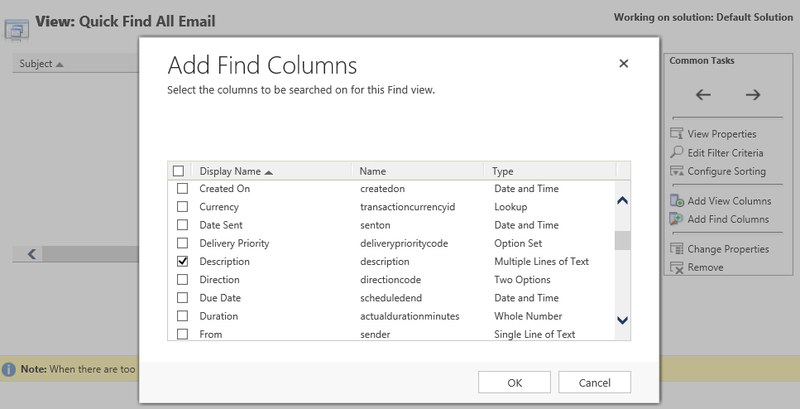 To enable the ability to search on the email body, you need to add the “Description” field as a “Find Column” in the Quick Find view of the Email entity, as shown in the screenshot below. After completing that step, save the view and publish the entity to make the change available in the system. Now that we’ve configured the search column, we can do a quick search to get our emails by using the search box on the activity list view view or by using the “Global Search” on the top right of the top navigation bar, next to the “Quick Create” button. Note that emails are not enabled in the “Global Search” by default so you’d have to add them (not required). If you have a few emails in your system, results are going to come back quickly. In the system that I tested against, I had about 700.000 emails in CRM so the search result took on average just over 30 seconds to return results (and I consider this good, because I’m running on SSD drives). That being said, in real life, 30 seconds or more of waiting time is enough to make users think that the system is frozen, or to just stop trusting in the application, especially if they rely heavily on this type of search. Greater details about the feature can be found here and you can also take a look at this video on the Microsoft Dynamics YouTube Channel. As a bonus, you should also activate the Org Settings “EnableQuickFindOptimization” and “EnableRetrieveMultipleOptimization” in order to get the best results. Thanks to Jean-François Cantin for that indication. If you don’t know how to update the Org Settings, here is a reference. After waiting long enough time for the emails to be indexed, the email searches started to return results within 5 seconds. Drastic improvement. The same solution was implemented into the client’s database and it seems to have made a huge improvement. This entry was posted in Architecture, CRM 2015, Database, Full-text search, SQL Server and tagged Full-text Search, Microsoft Dynamics CRM 2015, SQL Server, Update 0.1. Bookmark the permalink. but the Full Text Search is not there. Any ideas? Your DB needs to be at 7.0.1.x as well. Make sure you upgrade the target CRM organization using the deployment manager.